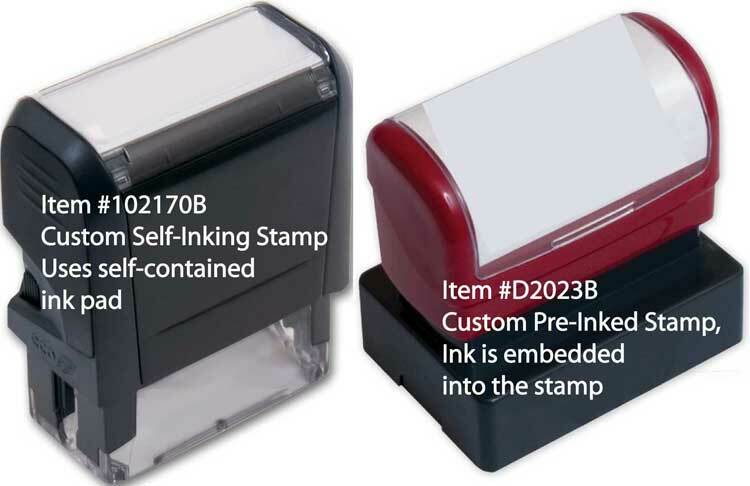 Excellent for rapid, high-volume use - Made with special ink embedded into the pad, with a moving mechanism (flip action) this stamp re-inks itself with each impression. Efficient and Easy to use! Impression area measures 2-3/8” wide x 7/8" tall. Ink Colors. Black ink only. Made with special ink embedded into the pad, simply remove the cover to stamp and re-cover when finished to preserve the life of the stamp. Efficient and Easy to use! Impression area measures 1-13/16” wide x 1-1/16". Ink Colors. Black ink only. Your personalization options shown in step 1, printing 1-8 lines of your custom message using standard default type styles / fonts, sizes and type positioning..